The "Take It!" came from looking out my back window in the kitchen at the outside thermometer and getting a warm reading. I ventured outside and saw the melt pattern of the snow on the deck. 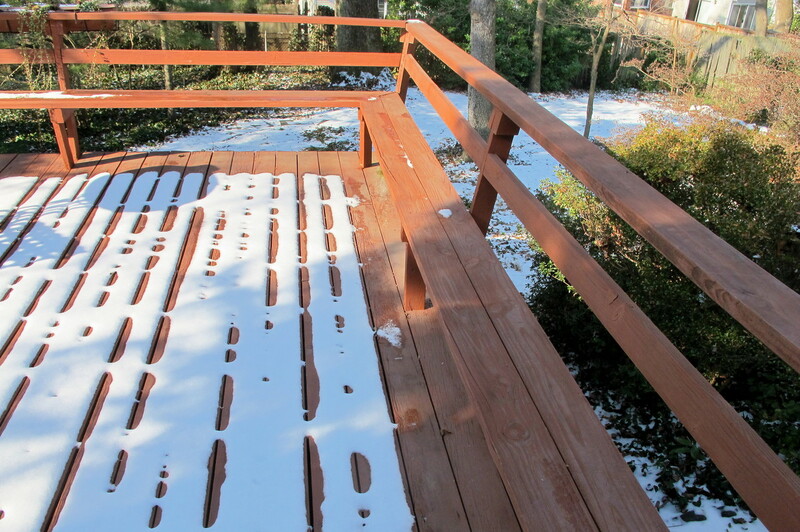 The warmer air going up under the snow via the separations in the deck planking created most of the spacing. 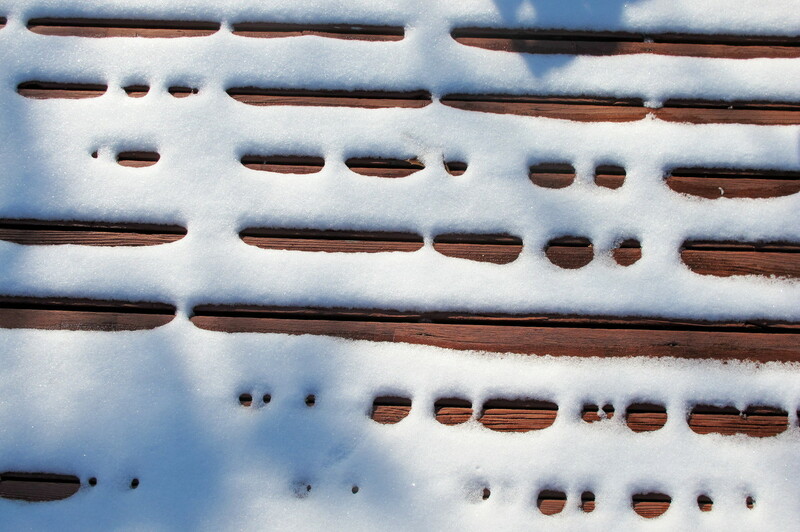 The result was a Morse Code looking snow melt. I got up on the chair portion of the side rails and took the photos to obtain the horizontal code look. The below photo of the table and chair was for additional context. The After Take: Some to whom I showed just the code photo alone were able to guess what it was but all thought it was an unusual shot. Quickly the conversation turned to how mild our winter has been thus far. I hope we get more snow as we need it to help fill our resevors. I hope everyone is surviving this winter with a minimum of discomfort. The little patterns in the snow look really cool. It looks like you have a beautiful backyard. Awesome deck. I wish we got snow here. Gorgeous day out in this picture. 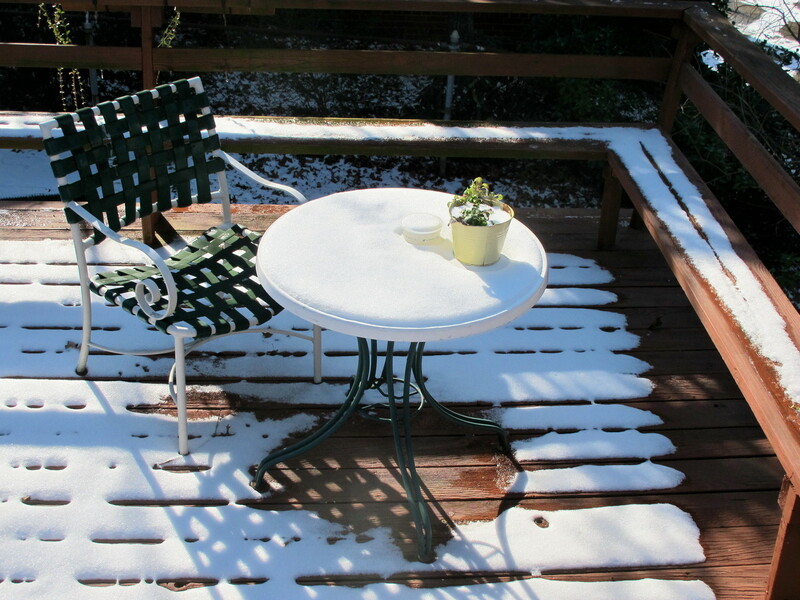 I love the way the snow has melted on the deck. Nice wooded back yard, a place to spend many days relaxing outside. Very nice. This is a beautiful photo session. So much to see in nature. +1 @ Jeff. That deck is killer! Thank you for the kind comments about the photo and the deck. I think I may have mentioned it before - but one of the big reasons for buying this house was the deck. I have enjoyed using it over the years for both solitude as well as entertaining.